James Burgess founded Squadron Venture Media in 2013. He started his career as a media buyer in the early 90's at Carat before becoming part of the early team that turned PHD Media from a London agency with 20 people to a global agency with 2,500 employees in 70 countries. After a spell as Media Director at Saatchi & Saatchi in Asia, he joined BBDO in Sydney as Head Of Strategy. He returned to the UK to found The Klondike Agency in June 2000, the first of a new wave of media strategy specialists that sprung up around the millennium. It was one of the first agencies to integrate digital media thinking into traditional advertising planning. Clients included BSkyB, General Motors, Travelocity, Clarks Shoes and Coca Cola. In 2003, Klondike consulted on the launch of Sky Italia, Europe's biggest brand launch of that year. He left the agency he founded in 2006 to become part of the management team that launched Seatwave.com, attracting $50m in VC investment. The company gained rapid traction growing revenues from $0 to over $10m in little over 18 months as it expanded across Europe. The company was named number one at the top of the Guardian's Tech 100 list in 2009 and was acquired by Live Nation/Ticketmaster in 2014. 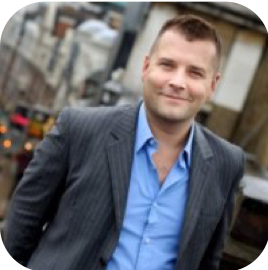 Since leaving Seatwave, James launched eHarmony into the UK market, spent a year developing brand strategy and the first TV advertising for Zoopla, put MOO.COM onto TV in the UK and US and launched and sold an online fine wine discount site. He founded Squadron Venture Media in 2013 with a simple mission - to bring together the UK's dynamic tech scene and its vibrant media & creative communities to build some of the defining brands of the early 21st century. Having worked on both sides of the client/ agency divide in both management, creative and media roles, as well as spending time in strategy consulting, Tom has developed an uncommon versatility which equips him well for the varied challenges facing growth businesses. Tom graduated from Cambridge University in 1996 with a degree in Social and Political Science and a full blue for boxing (from which he has subsequently retired). He spent the first ten years of his career in top flight advertising agencies, starting at J. Walter Thompson (‘the University of Advertising’), and including stints at both the biggest (AMV. BBDO) and, arguably, the best (St Luke’s) over the course of ten years. This period also included brief but invaluable stints as a strategy consultant (Marakon Associates) and as a copywriter (McCann-Erickson) where he wrote innovative ads for the likes of MSN Messenger, Bacardi, Coke, MasterCard and Nestle. At 30, Tom made the transition to the client side where he quickly specialised in inventing, reinventing, launching and scaling media brands. At ITV he rebranded ITV2, 3 and 4, and launched ITV Play , itv.com and ITV Mobile. At UKTV he led a successful portfolio rebrand which resulted in three years of consecutive double digit growth in viewing and profit and viewing as well as over 40 industry awards for creativity and effectiveness. Stepping out of broadcasting in 2011, Tom joined Vodafone Group as Global Head of Comms Planning and Media, responsible for optimising €700m of annual marketing expenditure across 21 markets. In 2013 he joined BBC Worldwide and as Director, Branded Services he relaunched the BBC’s global channel brands, into several markets. Latterly Tom focused on digital strategy and marketing, setting up a dedicated short-form unit, BBC Worldwide Digital Studios, who manage a 50m+ global social fanbase and create outstanding original short and micro-form content. Most recently Tom joins Squadron from A+E Networks, where he ran brand strategy and recently relaunched the HISTORY brand globally. Charlotte Harper has spent the last four years as Group Marketing Director at Zoopla. Building her marketing department from a small base of four people to a team of over twenty, she has developed one of the UK's best known and most-loved 'tech' brands. She was part of the core 'leadership' team who brought Zoopla to the stock market in their $1.6 billion IPO of June 2104. Prior to joining Zoopla, Charlotte headed up Match.com's UK business as its Managing Director. She started her career at Mars before joining BSkyB as Marketing Controller. In 2001, she moved to O2 as Brand Director before joining Travelocity as it's UK Marketing Director. At Travelocity, she helped develop the brand both in the UK and in other European markets before working on the acquisition of Lastminute.com in 2006. Charlotte has an almost unique blend of strong, blue-chip traditional marketing experience twinned with hands on experience of scaling several UK tech companies. She is one of less than a handful of UK marketeers to have helped transform a consumer facing tech brand from relative obscurity to a 'unicorn' stock market listing. Marc Mendoza has run, uninterrupted, many of London's top media-buying agencies since the 1980's making him potentially the most accomplished media buying professional in London. He was Media Director at the 80's and 90's creative powerhouse WCRS before going on to found the media buying specialist Mediapolis. Since the late nineties through 2013 he has led UK media operations for the global agency network, Havas. He stepped down as CEO from Havas Media in 2013 to become non-exec Chairman of VCCP Media and vice-Chairman of the dominant UK poster buying specialist, Posterscope. At Squadron Venture Media, Marc leads the media investment function - negotiating innovative 'off-grid' media deals on behalf of our clients.